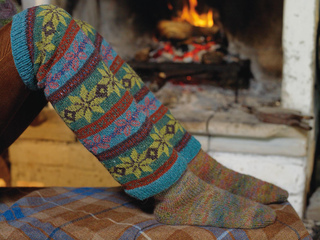 Knit these accessory fairisle legwarmers from Rowan Knitting & Crochet Magazine 52 online, a design by Jemma Weston using the ever popular yarn Felted Tweed (merino wool and alpaca). Knitted circularly in one piece and with contrasting ribs, this knitting pattern is for the experienced knitter and is a free pattern to download. This is a FREE pattern available to members of the KnitRowan website. leg and is 48 cm (19 inches) long.